The question is… will FaceTime replace Skype as the predominant way of making video calls? When? It wasn’t long after Apple announced FaceTime for Mac that my old Skype buddies were asking me to test it out. Dan York has a good summary with his initial call with Jim Courtney. Phil Wolff generated a scorecard. My calls worked flawlessly and I added FaceTime to my desktop. I’ve also written a set of posts on FaceTime and how it is redefining communications. Now consider how Apple will rollout FaceTime. Getting 150m users – From Beta to FaceTime1.0 – When? Before Xmas? 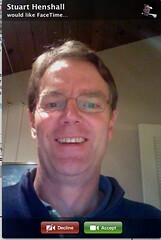 Today Apple provided a FaceTime Beta (download here) for Macs. It’s a simple download and install. It will provide some initial usage and scaling information for Apple. The complaints today trace to when will I get it on Windows? Etc. Apple in their announcements failed to mention one key aspect. When FaceTime moves from Beta it will become part of iTunes updates – just like Quicktime. (We can also expect that FaceTime will become part of the next OSX update next year.) When is this iTunes release most likely to happen? With the release of iOS 4.2. Why? Perfect timing to bring video intomany more Christmas stockings. Will they reach 150 million? Not sure what the number of iTunes accounts are and the relevant iPhone4’s. So it will still take awhile. So 10’s of million will be addressable by early next year. Likely to be as easy to find someone on FaceTime as it is on Skype. Which brings me to my next point. Traditional desktop IM clients are limited by a complicated buddy approval process. Eg please add me as a contact. Importing your contact list also didn’t add a lot of value. If you could even call them you had to have a SkypeOut account or something similar which costs money. That’s where FaceTime differs. By using your address book (which increasingly is also the one in your phone too) they turn every email address or phone number into a potential free FaceTime video call. There’s still a few issues with this to be sorted out. However FaceTime wins by using existing identifiers and not by creating new accounts. BTW the average Skype user has a small network and fewer than a dozen contacts. With Facetime there’s no buddylist to build. It’s not quite out of the box possible to call anyone – they must have FaceTime. If the above iTunes distribution comes true then FaceTime becomes Windows to Windows too. More importantly it makes most newer PC’s +Mac a Video Phone. Up to you whether you will use it. Mail App: Less important – although coming. Adding a FaceTime address into your Safari browser just starts a call. That makes click to call easy. With email becoming enabled it won’t be long before any email is also a simple phone call response. Perhaps we may even start talking to one another again. There’s a whole lot of things that matter to organizations when email ID’s become phoneable. While we on this. It seems RIM / Blackberry doesn’t have a Video strategy. I wrote a post about the enterprise some time back. See FaceTime and the Enterprise. Look at how FaceTime is evolving and tell me know that Apple isn’t targeting the enterprise, Rim and Cisco. Apple has tapped in to something big that Skype doesn’t have. That’s a legion of evangelical users who want to share their mobile experiences with their desktop friends. All those college kids that just arrived with a new Mac. For the lucky ones with iPhones – they are going to start FaceTiming the one’s that are on Macs. In fact iPhone or iPod4Touch users are just going to be infectious. Dad’s on Windows? No matter download the latest iTunes and see where I am today. The fact that the iPhone has two cameras turns it into a private “you have to see this” event. It’s a little easier than UStream although I’m sure that conference calls will come. What matters is the sharing process means that FaceTime will usurp Skype for these users just when they are beginning to use Video. In the US they already have unlimited calling and texting for the most part. So Skype will lose importance. Showing others where you are today. That can create envy and excitement. Colleges are natural places for this to happen – plenty of WiFi. Still 3G makes the difference. Perhaps this only happens next year when the rumored Verizon phone enters the market. Till then you can jailbreak, and use My3G to launch effective FaceTime calls from anywhere. (Last week I wrote about Tango which already enables this and it creates new opportunities). When I look at all the pieces being put into play here. I see Skype looking just like Netscape when Microsoft realized they had to create Internet Explorer. Netscape wasn’t the platform – it wasn’t built in. Skype’s problem is – it’s not built into anything – it’s an add on. Even on a Windows machine – iTunes is more important than Skype as it supports a hardware device – the iPod. FaceTime doesn’t belong on Windows anymore than Skype does. However it extends the reach for “free” and possibilities for video by connecting mobile and making it all simple. Do people really think about cross-platform? Yes I have friends on Android. It’s time for another thought experiment. Consider iTunes and FaceTime ultimately being on Android. There’s no reason why short-term (other than focus) Apple can’t offer an Android and Symbian FaceTime app. Other than “experience” which can probably be good enough. If Amazon can start an Android store – couldn’t Apple? Is an Android iTunes store really too far-fetched? Probably is. Still Quicktime is a good example. It works on Windows. Why not FaceTime for all these other operating systems? Provide them soon and open up the standards. As for iTunes its a tough call to provide those Android phones with a Windows desktop type option. Yet – what was a good strategy for Windows may also work on Android. iTunes – a screen-facing store for everyone anywhere? Now where were the problems? FaceTime is simple. It also continues running in the background just like it does on the iPhone even when you quit. In fact the behavior is exactly the same. Quit Facetime and receive a call and it pops back to life. You can only turn FaceTime off by signing out or by setting it to off in preferences.You can even hold a Skype call and FaceTime call at the same time and provide both calls with your video! You can select your email ID’s to associate with FaceTime. If they are not already registered with iTunes then Apple will send you another verification email to confirm your ownership. Where FaceTime misses a trick is not confirming which of my contacts are already registered with FaceTime. That would create a much more effective active contacts list. Eg FaceTime should cross check my address book with registered users. Unfortunately, to call my iPhone you need my phone number. To call my desktop you need an email. I suspect this will soon be fixed. Then I have the option of multiple extensions ringing. I can take that call on the desktop (if on) or on the phone. (Frankly I already prefer the phone). This also means that right now I can call my desktop from my iPhone (and both emails and number are known by iTunes). Apple has options. This could be a feature or not. The phone really should have priority with a handoff capability. Favorites and Recent Calls is going to be the way FaceTime is put to work. It’s also the same as the iPhone in this regard. There’s no presence and frankly that doesn’t matter much. It’s pretty meaningless. What I want to know is of my contacts who are active users. Yet our video network is generally fairly small. The next thing users clamor for is a messaging feature. Apple already has a messaging client on the iPhone which manages SMS. There’s no reason the same messaging app can’t also handle FaceTime messaging. This is a real plus and solves the “context” before the call problem. I’m sure only a minor change will be required to go from “notification” to “message” or “context” management. So “FaceTimeText” before the call as a potential option. So is no calls out of the blue without context. This is like free “SMS” anywhere and anyone. Just don’t expect them to turn it on too quickly. That’s why a “context” approach may come first. That will also work with other “name services” that perhaps want to use FaceTime protocols to enable calling between their members. Communications is about services and people and the context and reason for the calls. Add in location and there’s another set of possibilities too. With the right API’s FaceTime will create yet another business and this time we may even be paid for taking calls. (HaHa). Seriously I think location and an open ID framework that can be used by other services will be key. Keen remains just one type of example. There’s not many VoIP / Communication projects around today that are more exciting than what’s happening with FaceTime. Some other communities will grow up (like Tango) although likely to suffer Fring like challenges. I’m beginning to feel Skype is today’s Netscape. It had a good run and then ran out of advantages. Yet there are many ways to develop the FaceTime roadmap. There’s hard choices ahead and so far it appears the rollout is going to schedule.